Dropped like a Hatputito: Project Ending and Another Blessing! I know I said in my previous post that I will update you guys, supposed to be last Monday, about how my very first VA project turned out. You see, it is not just the payment that I am after but actually the feedback. Since I am still starting out and the competition for this kind of position is very tight and my confidence level is very low, I need something to back me up. Having a positive feedback filled that spot for me. In addition to that, I am contemplating of adding another pressure to myself to up my game even more. There is this challenge going on in our students' group called #AprilHustleChallenge. We have a form to fill for the whole month of April where every day has a number of applications/proposals we need to submit on different platforms like Upwork, Hubstaff.com, and Onlinejobs.ph. I have already talked about my fear of applying before and then this challenge came out. Maybe it is God's way of helping me win my battle. It is already the 6th of April so apparently, I must catch up on the previous days I have missed out. I will read the rest of the mechanics of this challenge first and muster up the courage to take this. It should not take longer than a day to decide since time is running. Oh and by the way, remember my anniversary post where I talked about getting an SSL for my website when I have the resources to do so? I got a notification on my page about enabling free SSL for custom domains! 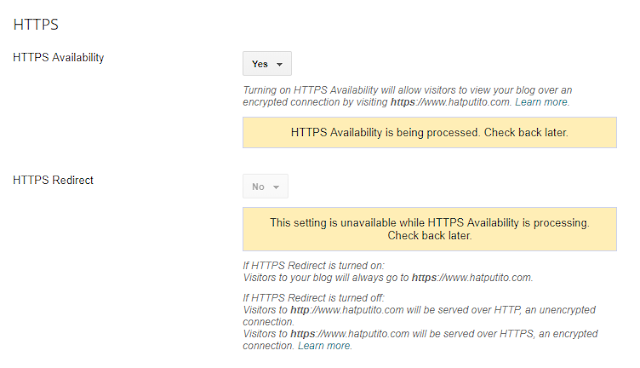 I had to wait for few minutes to enable the HTTPS Redirect. Surprisingly, when I searched about this now, this free SSL from Google has already been around some time in December last year. But at least it saved me money from buying from another provider.